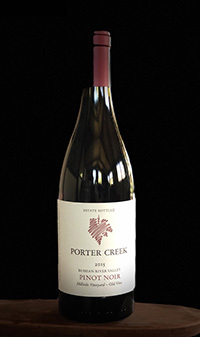 Planted in 1973 and continuously producing with many of the original vines, this is among the oldest Pinot Noir vineyards in the Russian River Valley. Rather than replanting the aging parcel, we have revitalized it with clever interplanting, vine-by-vine replanting and soil improvement work. Aromatically it leans in the red fruit and rose petal spectrum, with just a little dark red fruit in the background giving some palette weight. The old vines give powerful yet amazingly silky tannins. Many of the past bottling are still drinking well with 20 years or so of age on them.